The 2004 flood season brought District residents a welcome change to the drought conditions that have plagued western states over the past few years. Mountain communities in Boulder, Jefferson and Douglas Counties also experienced reprieve from the all-too-familiar high fire danger. The spring runoff was relatively uneventful posing minimal flood threats to the Colorado Front Range. April and May passed with only two days threatening heavy rain and neither of those days produced anything significant in the District. This quiet start to the flood season changed abruptly on June 8 when an intense storm with copious amounts of rain and hail pelted parts of Jefferson County, Lakewood, Golden and Wheat Ridge. By the end of the June many Jefferson County residents probably wondered when summer would begin. June 8 was the first of five days in which flash flood warnings were issued for the District. Seven other days warranted flash flood watches, making 2004 one of the most active flood seasons in the 26-year history of the District's flash flood prediction program. Fortunately, no lives were lost and the flooding that did occur was localized with total damages not reaching disaster proportions. The more notable events are described later in this article. Three flood protection handbooks completed in prior years are available online and in hard copy. They contain helpful advice on what individuals can do before, during and after a flood to protect themselves and their property. These booklets were prepared specifically for residents of Arvada, Boulder County and Denver. Jefferson County is taking similar steps to inform its citizens about local flood hazards. This handbook will be available next spring. This past year the District and Jefferson County cooperated in developing three public service announcements designed for use by local cable and TV stations. The PSAs focus on flood dangers in urban areas and along mountain streams, and the increased flood risk caused by wildland fires. These videos can be viewed from the District's website. In 2003 the City of Boulder and the District began developing a flood safety information website which is targeted for public use in 2005. Jefferson County is partnering with the District, the Colorado Water Conservation Board and the Colorado Office of Emergency Management to expand the website design to address Jefferson County flood hazards. The multimedia website will feature flood videos, testimonials, descriptions of past floods, aerial photographs and flood inundation maps. A media kit will also be available for release to local newspapers and TV stations to assist them with providing useful public information after a flood. EMWIN is a National Weather Service satellite downlink/rebroadcast system that stands for Emergency Managers Weather Information Network. It allows communities to develop their own unique applications including civil emergency messaging. This low-cost system will be ready for testing in early 2005 and was made possible by a coalition of local governments partnering with the District, NWS, Xcel Energy and others. The District provided the initial start-up funds of $15,000. Local emergency managers, under the leadership of Jim Lancy from Arvada, secured an additional $34,000 from a DHS grant to acquire 31 EMWIN receivers, antennas and software. Jefferson County administered the DHS funds and provided warehouse space of equipment storage. Xcel Energy approved use of their Cherokee Power Plant for the initial rebroadcast station and also donated $9,400 to cover the installation costs. David Baca with Xcel deserves much credit and thanks for the progress made to date. The satellite downlink and relay station will be located at the Adams County facilities near I-76 and East 72nd Avenue. Denver plans to assist with acquiring the necessary downlink computers and the NWS will host the public website. Additional partners are being sought to help with recurring communication costs. Skywarn Systems, Inc. of Fort Worth, Texas is the project consultant. The project information website can be found at www.udfcd.org/emwin. The District has been a CoCoRaHS sponsor since 2002. CoCoRaHS stands for "Community Collaborative Rain and Hail Study" and was started by the Colorado Climate Center at Colorado State University following the 1997 Fort Collins flood. Nolan Doesken heads this nationally recognized program that now includes cooperative observers from neighboring states of Kansas and Wyoming. Nebraska operates a similar program known as NeRAIN. Over the past 3 years the network in the District's area of interest has grown to over 800 observers. With all of this great data readily available from the Internet, the District has developed data integration tools that combine ALERT and CoCoRaHS data in a GIS-like browser display. This new procedure can be downloaded from our ALERT website by connecting to the "XML Demo Page." Anyone interested in measuring rain, hail and snow can easily sign-up as a CoCoRaHS volunteer by visiting www.cocorahs.org. The District's ALERT flood detection network continues to grow, providing critical early flood detection and decision support for local emergency management and response agencies. The gaging network includes 168 stations that use low-power VHF radios to relay data from 152 tipping bucket rain gages and 82 stream/reservoir water level sensors. Sixteen stations are equipped with weather instruments that measure wind speed/direction, air temperature, relative humidity and barometric pressure. Some mountain weather stations provide data (fuel moisture/temperature) for fire weather purposes. ALERT weather stations have also been used to monitor solar radiation and soil moisture. Eight new stations were added to the ALERT network in 2004. Rain gages were installed at Aurora Fire Station 12, West Metro Fire Station 13 at Ken Caryl Ranch, and on Shop Creek in Aurora. Boulder County installed two new rain gages (Porphory Mountain and Fairview Peak) in the Overland Fire burn area near Jamestown. 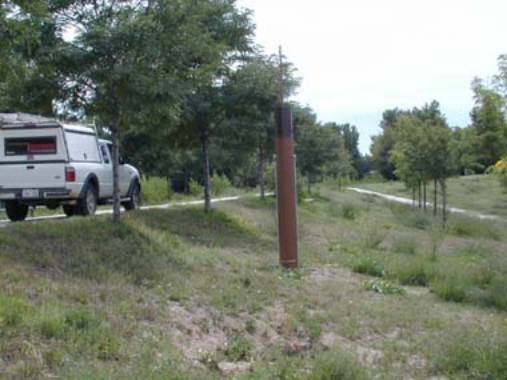 Combination rain/stream gages were installed on Goldsmith Gulch in Denver, on Murphy Creek in Aurora, and at the Flying J detention basin in Aurora. New stream gages will soon be operating on Lakewood Gulch in Denver and Sand Creek in Aurora, and the weather station previously located at the Urban Farm at Stapleton should have a new home by spring. OneRain Incorporated of Longmont provided the 2004 ALERT maintenance services for the 13th consecutive year. The ALERT website alert.udfcd.org has become the preferred way to access the real-time weather and flood data. Dial-up modems are still available but seldom used, and only a handful of users maintain this capability. This speaks highly for the dependability of Internet communications, but it does create a critical point of failure for some users. The District recognizes this potential and continues to emphasize the importance of redundant communication paths. The District also persists at modernizing the ALERT system by implementing faster and alternate Internet connections, updating display features, designing improved metadata interfaces, utilizing push technologies (FTP and email), and developing better data integration techniques. One major improvement this year was the addition of a backup webserver that became operational in June. Access to this system is restricted to weather forecasters, local governments and emergency response agencies. The usage statistics for 2004 show why the second server was so needed, with the public website receiving 2.29 million hits and 1.05 million individual data requests over the past 12 months. These figures do not include the text products that are disseminated to the NWS every 5 minutes or the alarms messages that are automatically sent by via email. The District's 26-year-old flash flood prediction program (a.k.a. F2P2) provides forecast and notification services directly to District local governments from April 15 through September 15 each year. HDR Engineering Hydro-Meteorological Services of Denver provided the operational forecasts during 2004. Bill Badini was HDR's project manager and lead meteorologist. John Henz provided the overall training and support for HDR meteorologists. This was the fourth consecutive year for HDR as the District's meteorological services provider. The 2004 flood season could be judged as below average in terms of the number of threat days (31 vs. 35 average). However, the amount of rainfall that occurred in certain parts of the District like Jefferson County approached record levels and the number of serious threat days was twice the average. Flash flood watches were in effect for three days in June (28,29,30), three days in July (15,16,22) and two days in August (5,18). Flash flood warnings were issues for five days (June 8&27, July 23, August 4&18). As mentioned at the beginning of this article, this was an impressive rain year compared to the past few drought years. One indication of this is the number of alarms generated by the ALERT system. The automated alarm notification software developed in 2003 had it first real workout this year with 18 days producing 127 rainfall alarms from 61 stations. Two alarms were caused by rainfall amounts that exceeded 3 inches within a 2-hour time period (Denver West in Lakewood on 6/8 and Denver Zoo on 8/18). One-inch per hour rate alarms occurred 53 times and the other 72 alarms were caused by intense downpours of 1/2-inch in 10 minutes. This may be a record number of rainfall alarms for the ALERT system, although those statistics are not readily available. With regard to stream gages, new record levels were set for six stations as noted in the peak flow table. Bear Creek at Lowell Blvd. Niver Creek Detention at 88th Ave.
Little Dry Creek at 64th Ave.
South Platte River at Union Ave.
South Platte River at Dartmouth Ave.
An early morning cold front set the stage for 2004's first outbreak of flood producing storms in the District. Messages issued at 4:30PM were forecasting 1.5"/30min rainfall rates. Around 8PM storms began developing along the urban foothills of Jefferson County and at 8:36PM the first ALERT rainfall alarm of the year was triggered by a gage on South Table Mountain. Over the next two hours Golden, Lakewood, Wheat Ridge and nearby areas were pounded by heavy rain and hail. The Colorado Mills shopping mall was hit especially hard with the ALERT gage there measuring over 3 inches in 90 minutes. Homes were flooded and streets were closed in the vicinity of W. 32nd Ave. and I-70 where an unconfirmed precipitation measurement of 5" was reported. A Golden firefighter stated that flood fighting at the intersection of 20th Street and Washington was like working a swift water rescue. Hail depths up to 18 inches were reported in some areas and motorists in Lakewood were rescued from cars. Lena Gulch flooding set new records at all 3 stream gages, which have been operating since 1984. It is interesting to note that this event occurred exactly 17 years to the day (6/8/87) from the previous Lena Gulch record flood. In Boulder County less intense rainfall caused mud and rock slides in the Heil Valley Ranch open space park near Jamestown, a result of burn area runoff from the 2003 Overland Fire. 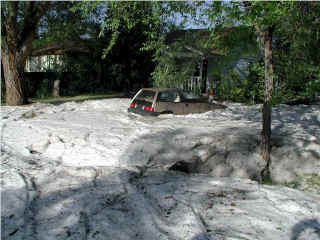 Large hail and street flooding returned to the metro area the following day. 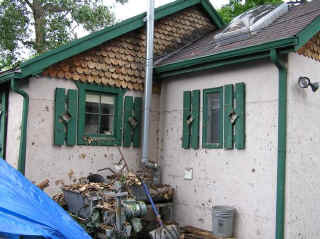 Flood and hail damage for the week was estimated at $100 million. Hail was not a problem this afternoon but the rains were. The Jamestown area in Boulder County was hit a second time by mud and rockslides. More serious flooding occurred in Jefferson County in northern Golden and along Massey Draw at the Meadow Ranch subdivision at Deer Creek Golf Course. 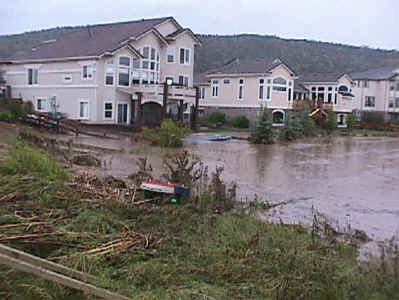 The News 4 helicopter provided outstanding video coverage of the Massey Draw flood at its peak. Leonard Rice Engineers completed a post-flood survey for the District to document flooding limits, estimate the flood magnitude and provide a better understanding of why damages were so extensive. According to Jefferson County building officials at least 15 homes were damaged in this area. This was surprising given the fact that the developer had gotten FEMA to revise the floodplain map, effectively removing the developed parcels from the floodplain. 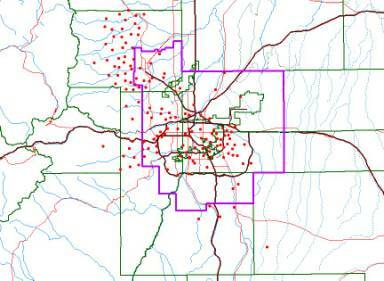 Consequently, few residents in this area were covered by flood insurance. The worst flooding in Golden occurred along a small drainage known as Arapahoe Gulch, which runs along the west side of Washington Street. 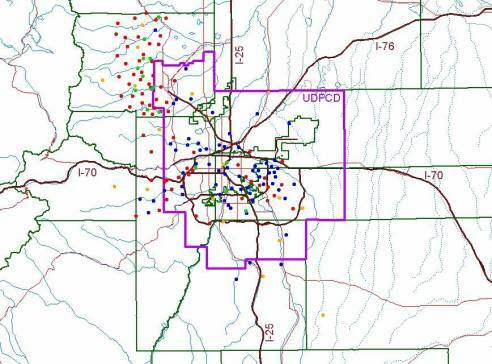 Affected residents there may have a similar predicament with regard to flood insurance since the hazard area associated with Arapahoe Gulch is not shown on the Flood Insurance Rate Map. One home in this area just upstream of Colorado Highway 58 was almost totally submerged by floodwaters and caught fire during the flood. Fortunately the structure was found unoccupied by Golden firefighters during underwater rescue operations. The storm that caused this flooding produced between 3.5 and 4 inches of rain over the watershed as confirmed by five independent CoCoRaHS observers. With only a few rain measurements available from the Massey Draw area, plans are underway to reconstruct the storm rainfall for the entire drainage basin using radar precipitation estimating techniques. The largest point measurement of 2.96" was taken in the upper basin west of C-470 by a CoCoRaHS observer. The West Metro Fire Station 13 ALERT gage reported only 2.05" but had a 2-day Saturday/Sunday total of 3.58", which likely aggravated Sunday's flood. The peak discharge through the golf course was estimated at 900 to 1,000 cfs, approximately a 10-year event. Messages issued at 12:30PM predicted storms capable of producing up to 2 inches of rain in 30-45 minutes. Sugglish movement of these storms caused 3" to 4" over a 90 to 120 minute period. Flash flood warnings were issued by the NWS around 4PM. ALERT rain and stream gages were given a workout this day with 23 rainfall rate alarms occurring between 2PM and 5PM, and 9 stream gages recording annual peaks. The new Murphy Creek Golf Course rain/stream gage in Aurora measured 2.36" and a flow depth of 3.4 feet. 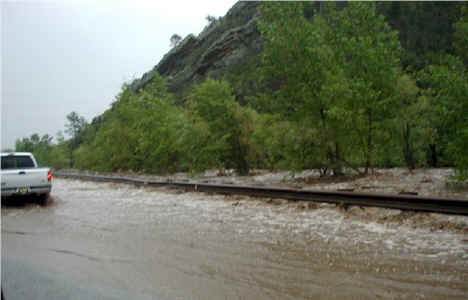 Further downstream, news reports showed roadways being overtopped along Sand Creek and Coal Creek. The Niver Creek detention basin at W. 88th Ave. and I-25 in Thornton filled to a depth of 21.3 feet, which was only 0.3 feet below its 6/3/89 high water record. This flood control structure clearly prevented damages, as did a number of other smaller detention facilities in the northern metro area. The highest rainfall amounts occurred in NE Jefferson, Broomfield and western Adams County affecting Commerce City, Northglenn, Thornton and Westminster. Some rain totals exceeding 3 inches. Early threat notifications were issued by HDR at 11:45AM, well before the 2:06PM rainfall alarm at Niver Detention. The NWS issued a flash flood warning for western Adams County at 3PM. Heavy rains this day hit in Douglas and Elbert Counties with the Haskins Gulch and Elbert ALERT gages measuring 1.26" and 1.97" respectively. These rain amounts were not overly impressive, but the stream level on Cherry Creek at Castle Oaks Road rose a remarkable 5.3 feet between 8:30 and 9:30PM, setting a new record. Early notifications concerning the potential were made at 3:40PM and the NWS issued a flash flood warning for Douglas County around 5PM. Impressive rainfall fell over much of the District this day, bringing closure to the big storms of 2004. The entire District was covered by a minimum of one inch of rain. The Denver Zoo received 5 inches while a number of other locations reported over 3 inches. The ALERT system generated 23 rainfall alarms equaling the July 23 count. Maximum water levels for the year were recorded for 21 stations. The Englewood Dam gage set a new 18-year record stage of 23.2 feet. Flooding was reported at many locations with the more notable flows occurring along Cherry Creek, Sand Creek and the South Platte River. An old sheet pile drop structure failed on Sand Creek just downstream of the Quebec Street crossing causing much concern. Subsequent channel degradation threatening the bridge forced CDOT and Denver officials to pursue a quick remedy. Message 2 (flash flood watch) was issued by HDR valid for the entire District from noon to 6AM Thursday. Heavy rainfall started in western Boulder County before 2PM and moved into Jefferson County around 3PM. At 3:30PM the first flash flood warning was issued for Jefferson County. Later warnings were issued for Aurora, Denver, Arapahoe County and Douglas County. Flooding continued into the early morning hours the next day. The five events described above are the days that flash flood warnings were issued for the District. Heavy rainfall and minor flooding occurred on the following 16 additional days: June 9,26,29; July 14-17,19,22,27,28; August 5,6,10,30; and September 4. More information about these and other interesting weather days can be found by visiting the ALERT website alert.udfcd.org. Annual reports by HDR Engineering and OneRain are also available.